LinkedIn is a business networking site for professionals. With more than 65 million members worldwide, LinkedIn can help you find opportunities and an assortment of career opportunities including freelance work and telecommuting jobs, as well as home business networking opportunities. Many job openings posted on LinkedIn are exclusive to LinkedIn and are not advertised anywhere else. It means creating a LinkedIn login and setting up a great LinkedIn profile, perhaps even with a custom LinkedIn URL, can open doors that might otherwise be closed. Job seekers who are on the hunt for at home employment need to maximize their LinkedIn profiles. While a resume under separate cover might be required during the application process, your profile is one of the first things potential employers are likely to see. Make sure the entire “resume” area of your profile is sharp, relevant for the type of work you’re going after, and current. If you search for and join groups related to the kind of work you're looking for, you'll not only show employers you're active in that area but also, you may also be able to invite some of them to join your LinkedIn network through your group memberships and participation in discussions. Since networking is one of the main benefits of LinkedIn, building your network is key to connecting with the employers who are most likely to be interested in hiring you. One of the things that make LinkedIn ideal for the work-at-home job searcher is that it offers a variety of ways to find open positions, as well as connect with others who can help you in your job hunt. 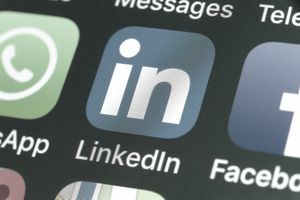 LinkedIn membership has a couple of options, including a paid version, but the basic free LinkedIn account has plenty to offer job seekers. Click the jobs tab once you're logged into LinkedIn. At first, the system will automatically generate jobs it thinks you may be interested in based on your profile. But you can use any of the many search features LinkedIn has to offer to find thousands of more jobs that you might be interested in. For work from home jobs, include terms like "telecommute," "remote," "virtual," "offsite" and "work from home" in your searches. You can join groups on LinkedIn that are relevant to your current field, your desired field, or groups related to finding jobs. These groups may provide you with direct emails about job leads and more. Potential positions may also come up in discussions, so relevant groups are well worth seeking out. Some groups may require that you be approved to join. As you gain connections on LinkedIn, make sure some of your contacts are aware that you are looking for a work-from-home job. They may have connections they can introduce you to who is currently hiring or planning to hire. Do not underestimate the power of introductions. Also, don’t be afraid to ask for recommendations from people who know you. Many job postings on LinkedIn specifically state they give preference to people with strong recommendations. Don't forget to let people know about your profile as well. If you have a website or blog, add the LinkedIn Badge to it, so potential employers can learn more about you. In addition to its free basic account, LinkedIn also has a premium paid membership option that may be of help to job hunters. For one, you can get information on who has viewed your LinkedIn profile and send notes to potential employers. Like any outlet that advertises work-at-home opportunities, LinkedIn isn’t immune to work at home job scams. However, it's easier to avoid them on LinkedIn than open networks like CraigsList and job boards like CareerBuilder. As you scan possible positions, click through to the posting user’s and company’s profile, if there is one. If there's a company profile, you may see individuals who work in this company that you can check out too. Some of them may be connected to you, either directly or through another LinkedIn connection, you have in common.